An important substance in Graeco-Egyptian alchemy is Divine water, Theion Hudor, so called because the words for sulphur and divine are almost identical and it is made from sulphur and quicklime. The ancient alchemists appear to have either liked a joke as much as anyone else, or been really serious about how similarities in names indicate similarities in properties and purposes. 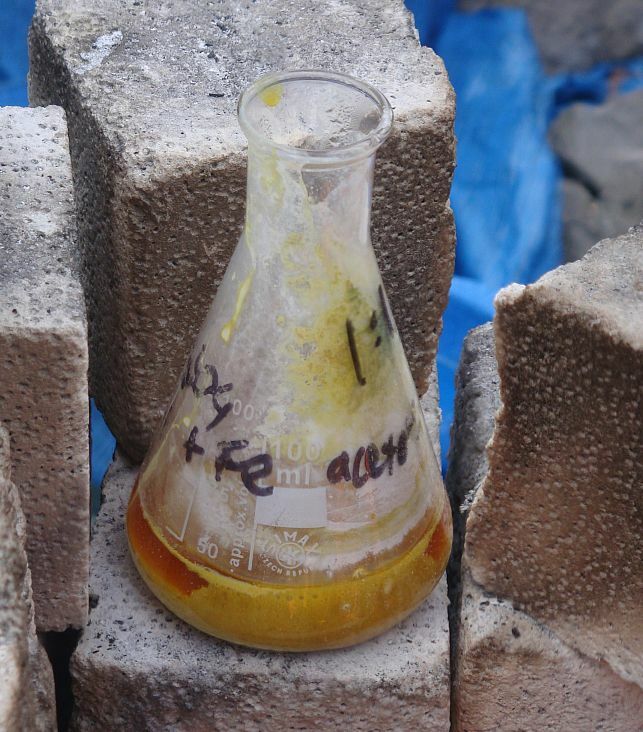 Burning sulphur was apparently used as a fumigant in temples and before rituals. “Divine water in a non-specific sense: this is the water made with two parts of lime and one part of sulphur, boiled in a pot, filtered and boiled once again.”Divine water is mentioned in the Physika et Mystika of pseudo-Democritus, the earliest set of alchemical recipes, although no recipe is given for it. The Leyden papyrus is a compendium of workshop recipes, used to make cheaper imitation gold and silver either for poorer customers or to defraud customers who thought they were getting pure gold or silver. Now the chemists amongst you will notice that the acidity of vinegar will react with the alkalinity of lime. The divine water only works if you have an alkaline solution, but it is unlikely that the vinegar will have enough acetic acid in it to neutralise the lime so it should still work. Anyway, I’ve managed to make it a couple of times before, but usually with water. It is best made on a strong fire or heater, since it takes quite a lot of heat and a good 10 or 20 minutes to get anywhere. I’ll try the urine method later, Lawrence Principe says that gets the best results. My previous attempts have resulted in a yellower more golden liquid. 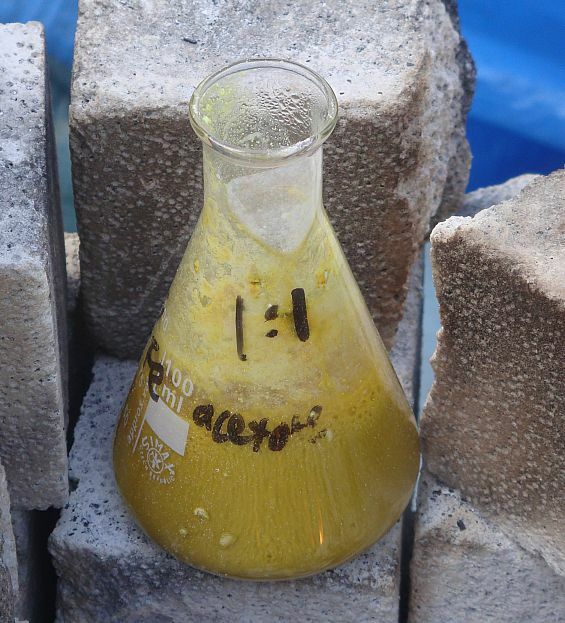 The wonder is obvious – we have a liquid which goes from yellow/ gold to red when warmed up, contains sulphur as is obvious from the smell, and tints metals. Yes, colours metals. Which is the subject of another post. Oh yes, you’ll be wanting to know what the red stuff is? It’s calcium polysulphide, Ca –S-S-S-S-S-S-S-S-S-S-S etc. Normally sulphur at room temperature and pressure forms rings of eight S atoms, but in caustic liquid near boiling temps the rings open up and join with others to form long chains of sulphur. The true things are always mixed with the false in order to deceive. All that is needed is one male and one female. You have performed a bad pounding, because the true burning is a burning that is white. Only from the pure whiteness of the snowy earth will the sought-for redness come. Divine water was crude butter of antimony. It was distilled in two ways during the Alexandrian period. The first was a reaction between aqueous sal-ammoniac and stibnite, and the second more refined way was a reaction between glass of antimony (antimony oxysulfate) and sal ammoniac. If you read Zosimus’ text On the Evaporation of Divine Water that Fixes Mercury [Hermes] you’ll see that it is the recipe for crude antimony trichloride and its conversion to antimony oxychloride by hydrolysis and evaporation. Chemists keep trying to interpret ancient alchemical texts literally, which is a no-no. Do you have any source for sal-ammoniac being the sacred salt of the temple of Amun? I disagree with your comment about intepreting texts though, since some definitely do produce what they say they will. The difficulty is which ones are correct and which ones are wrong or deliberately hide things. If you e-mail me, I’ll be happy to share my research with you. Regards. “Farther inland than these is that Libyan country which is haunted by wild beasts, and beyond this wild beasts’ land there runs a ridge of sand that stretches from Thebes of Egypt to the Pillars of Herakles. At intervals of about ten days’ journey along this ridge there are masses of great lumps of salt in hillocks: on the top of every hillock a fountain of cold sweet water shoots up from the midst of the salt: men dwell round it who are farthest away toward the desert and inland from the wild beasts’ country. The first on the journey from Thebes, ten days distant from that place, are the Ammonians, who follow the worship of the Zeus of Thebes; for, as I have before said, the image of Zeus at Thebes has the head of a ram. They have another spring of water besides, which is warm at dawn, and colder at market-time, and very cold at noon: and it is then that they water their gardens: as the day declines and the coldness abates, till at sunset the water grows warm. It becomes ever hotter till midnight, and then it boils and bubbles; after midnight it becomes ever cooler till dawn. This spring is called the spring of the sun. At a distance of ten days’ journey again from the Ammonians along the sand ridge, there is a hillock of salt like that of the Ammonians, and springs of water, where men dwell; this place is called Augila [αετός; Eagle]; it is to this that the Nasamonians are wont to come to gather palm-fruit. After ten days’ journey again from Augila there is yet another hillock of salt and springs of water and many fruit-bearing palms, as at the other places; men dwell there called Garamantes, an exceeding great nation, who sow in earth which they have laid on the salt. King Ptole-mæs discovered salt also in the vicinity of Pelusium [Πηλούσιον], when he encamped there; a circumstance which induced other persons to seek and discover it in the scorched tracts that lie between Egypt and Arabia, beneath the sand. In the same manner, too, it has been found in the thirsting deserts of Africa, as far as the oracle of Hammon, a locality in which the salt increases at night with the increase of the moon. The districts of Cyrenaica [Κυρηναϊκή] are ennobled, too, by the production of hammoniacum, a salt so called from the fact of its being found beneath the sands [ἄμμος] there. In this place also natural salt is procured by digging, and certain of the priests of Ammon convey quantities of it into Egypt. For whenever they set out for Egypt they put it into little boxes plaited out of palm, and carry it as a present to the king, or some other great man. The grains of this salt are large, some of them being even longer than three fingers’ breadth; and it is clear like crystal. The Egyptians and others who are respectful to the deity, use this salt in their sacrifices, as it is clearer than that which is procured from the sea. Alexander then was struck with wonder at the place, and consulted the oracle of the god. There is, I swear by Holy Hestia, with us a native salt of the earth, which is less far south, than the distance to the North Sea, the salt of Ammon, we call it. The mineral is crumbly developing under a crust, which, the crust which conceals it when you remove it, the underlying earth may be easily furrowed deeply with hands as with a hoe. Furthermore now that it is dug up, that is to say the salt, the very sight of which, as well as the taste is a most enjoyable delight. the Siwa Oasis and its temple inspired a certain mystique and awe in the ancient world. That Maria made use of sal ammoniac is not surprising. This amazing salt was applied to a number of chemical technologies in Egypt including fabric dyeing, leather tanning, glass manufacture, metallurgy, food preparation, and medicine, among others. It was a powerfully magic substance sourced from an honored and important temple and associated with the solar deity Amun-Ra. Herodotus describes the second hill of salt at Augila (αετός; Eagle) as being a hillock of salt like that of the Ammonians. The famed salt of the Temple of Amun is sal ammoniac (NH4Cl). This similar salt at Augila (and elsewhere) is easily explained upon considering that camels are watered and rested in a central area at such salt hamlets. Salt deposits were identified by Herodotus at each salt hamlet on the trade route, approximately ten days’ journey from each other. The first two oases encountered upon leaving Alexandria were the Siwa Oasis and Augila; both sources of sal ammoniac according to Herodotus. The primary source of sal ammoniac nearest to Alexandria was the Temple of Amun / Zeus / Jupiter at Siwa Oasis, with the second found at a location that translates to Eagle. Furthermore, Herodotus is explicit that these salts can be sourced from small hills or hillocks. This identification of salt deposits was available to the educated class familiar with Herodotus’ Histories, taught for approximately 700 years prior to its applications in Alexandrian chemical technologies during the Roman period. 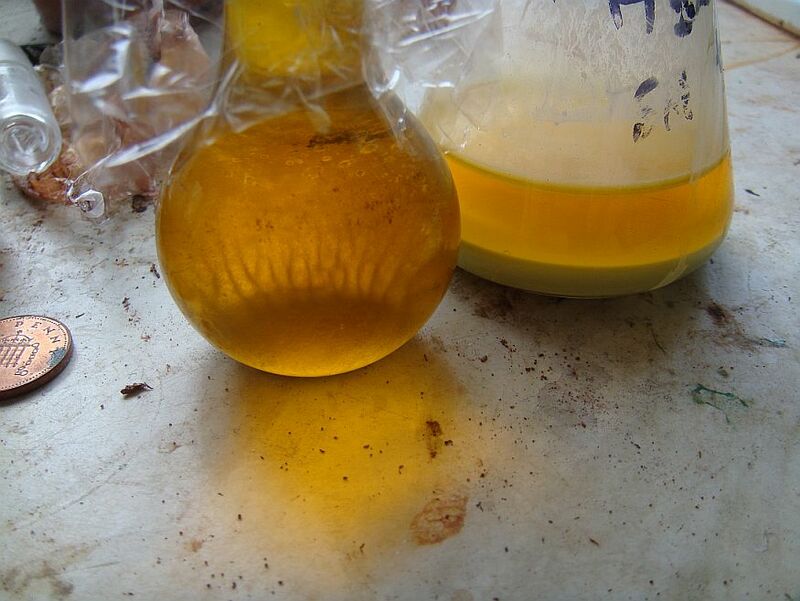 The problem arises when we consider that camel urine contains no ammonia, but is extremely rich in hippuric acid. The question regarding ammonium salts from camel urine was addressed by Bernard Read of Beijing Union Medical College in his 1925 article, ‘The Chemical Constituents of Camel Urine’. Camels drawn to watering holes are induced by the scent of urine to urinate at the same location. Enzymes acting upon fresh urine initiate ammoniacal fermentation of the hippuric acid present, resulting in ammonia-rich salt deposits, thus explaining unrefined sal ammoniac sourced from desert salt hamlets. The secret method of the Temple of Amun’s refined sal ammoniac manufacture was first revealed to the Académie Royale des Sciences in 1716 by Siccard, and later to the Royal Society in detail by Linneus in 1760. During Siwa’s lush spring each year, animals were set to graze upon unique legume pastures that were presumably rich in nitrogen and salt. Throughout March and April, peasants burnt the dried dung from the livestock as fuel, and then collected the soot from their chimneys. Narrow-mouthed glass vessels coated in clay were filled with the soot and heated above a furnace. 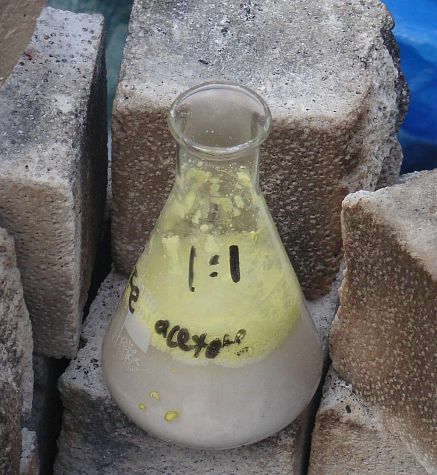 Purified sal ammoniac sublimate collected at the vessel’s opening, which was then removed. In 2008, an article was published, ‘Ammonia in the environment: From ancient times to the present’, in which two considerations regarding the Siwa Oasis were presented. The first was the consideration that the temple would have had considerably large dung fires that would have included offerings of local salt, resulting in ammonium chloride rich soot that could have been identified by the priesthood. The second finding was that in a detailed study on rain chemistry, the Nile delta showed very high levels of precipitation ammonia with Siwa having the second highest concentration in rain. Moreover, the ammonia values at Siwa coincided with equally high values of chloride. The Siwa Oasis turned out to be quite rich in environmental ammonium chloride. Thanks for that, it is interesting to see the other sources of salts like that. I note camels were domesticated thousands of years ago, which would give quite a while for ammonium chloride to build up. The Leyden and Stockholm Papyri typify only one of three schools of alchemy active during the 1st to the end of the 3rd centuries CE. Divine water as it was understood in other schools was a precursor to a fixed white powdered “Hermes/Mercury”. Synesius: Confirming it, he [Pseudo-Democritus] has added the untouched water of sulphur, the [water] produced only from sulphur, the divine water. Dioscorus: Your explanation is clear, O philosopher, but back to what he said: if [we are to understand it] in a general sense [lit. without qualification]: [water] made with lime [white calx]. An interesting aspect of the dialogue is that Synesius continues to use cover-names, never explicitly revealing the identity of the substances. He is pointing out the law of correspondences as it relates to color. The white lime is flowers of antimony; astringent once converted to liquid divine water. Synesius hints rather clearly that when sulfur is vaporized the Stone is whitened, yet he incorrectly characterizes sulfur as having a whitening power or being a whitening agent that causes the antimony to become white. Here he is addressing the process of whitening the Stone to flowers of antimony and the sulfur vapour (sulfur dioxide; SO2) byproduct of the reaction in accordance with operative technique found in the works of Maria, Cleopatra, Zosimus and others. This implies that his efforts to initiate Dioscorus into the use of cover-names, the identity of Sophic Mercury and the process of whitening the Stone – information that would be foundational for a new initiate – were only the beginning. Unfortunately, the text ends and nothing is known of Synesius’ complete interpretation or what subject he would go on to interpret. What is important is that most researchers agree that the fragment is an authentic account between Synesius and Dioscorus and date it to around 391 CE or earlier – around the time of the Theodosian decrees, the closing of non-Christian temples in Alexandria, and two years prior to Synesius becoming Hypatia’s disciple. This suggests that Synesius was familiar with alchemy relatively early in his career. It was the language of artisanal alchemy, intended for adept initiation and to protect trade-secrets. Alchemical cover-names are still used in the lab in some cases today such as Aqua Regia. Lime meant “lime of stones (vitriols)” derived originally from bronze-making trade-jargon to describe calcination of copper bearing ores. This was also applied to “Philosophers’ Lead (Roman Antimony)” to achieve antimony ash which was then either converted to a glass or distilled with sal-ammoniac to butter of antimony. Divine Water of archetypal Judeo-Egyptian alchemy generally refers to the type of products described by Zosimus in his On the Evaporation of Divine Water to Fix Mercury. The type of Divine Water addressed by Principe was of the type typified by the Pseudo-Democritus Babylonian-style Gilding Tradition in Alexandria, and not the tradition of Maria Hebrea and later Zosimus. Cross-referencing Divine Water in the ancient Greek texts and when read in context reveals a metal/non-metal water that is corrosive but that can also be converted via hydrolysis and evaporation to a “Mercury / Hermes”. Antimony trichloride to antimony oxychloride fits this profile perfectly and also explains the use of a distillation vessel and evaporation vessel depicted in early images. Mercury / Hermes was also known as Living Doubled Mercury for this very reason. It was created by sal ammoniac and flowers of antimony.